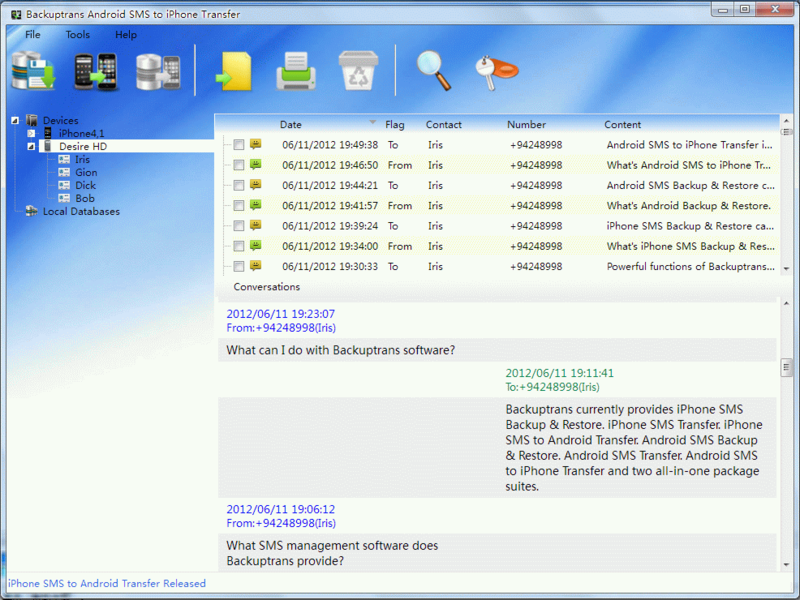 Backuptrans Android SMS to iPhone Transfer is designed to transfer Android SMS to iPhone directly. Connect both your Android phone and iPhone to computer, and you will get it done in a few seconds. Users can choose to either transfer all Android SMS to iPhone or just transfer the SMS with a certain friend as you want. Besides, you can also save the messages from Android to local database on computer for backup. Once you backup your Android SMS onto computer, you can use our software to copy those SMS from local database to your iPhone anytime. Viewing, exporting or printing out your Android SMS on your computer are supported, too. Users can export and save Android SMS as a file onto computer with a few clicks even though it came across a broken screen. File format includes txt, csv, word, html. Cleverly, Backuptrans Android SMS to iPhone Transfer let users print out Android SMS in threading conversations. You are flexible to choose to export/print all Android SMS or only the SMS with a certain friend. 1 Transfer Android SMS to iPhone directly. 1 Backup and save Android SMS to local database on computer. 2 Transfer SMS from local database to iPhone. 4 Print out Android SMS in a few mouse clicks.